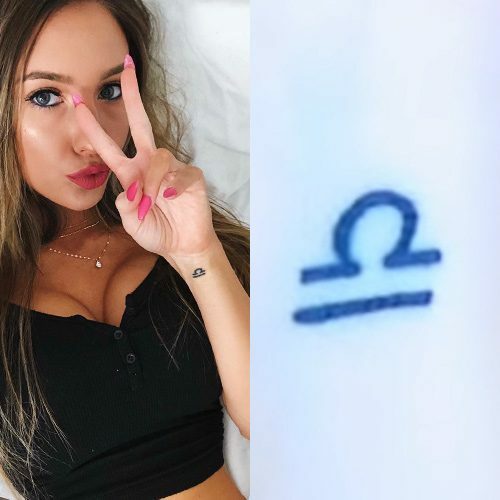 Stefanie Knight has a tattoo with the Sagittarius sign behind her left ear. 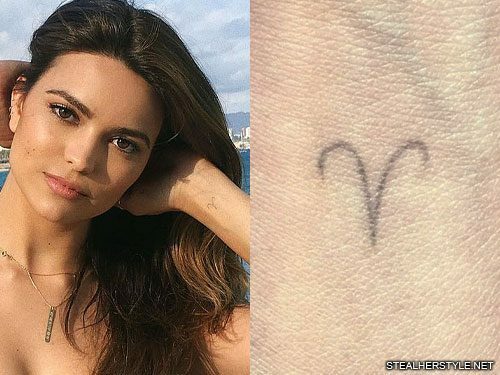 Kyra Santoro has an Aries symbol on her left wrist. 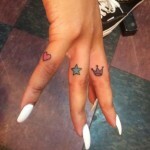 Aries in her zodiac sun sign. 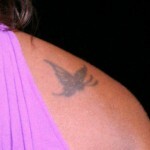 Tameka “Tiny” Cottle-Harris has a sun and the cancer zodiac sign tattoo on her lower back. 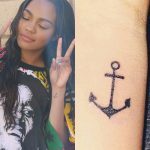 Alex Dorame has a tiny tattoo on her ring knuckle with her zodiac sign – Aries. 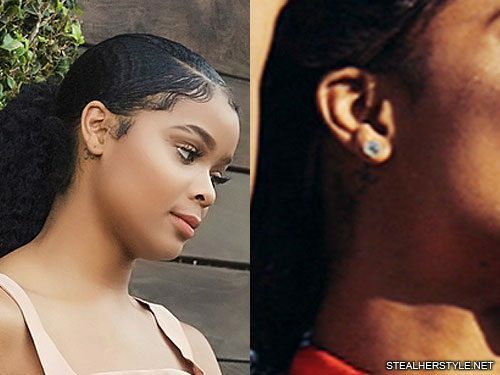 Ajiona Alexus has a tattoo of the Pisces symbol behind her right ear which is almost identical to Rihanna’s. 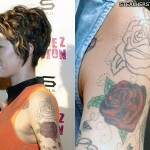 Both women have Pisces as their zodiac sign. Ajiona was born on March 16, 1996. 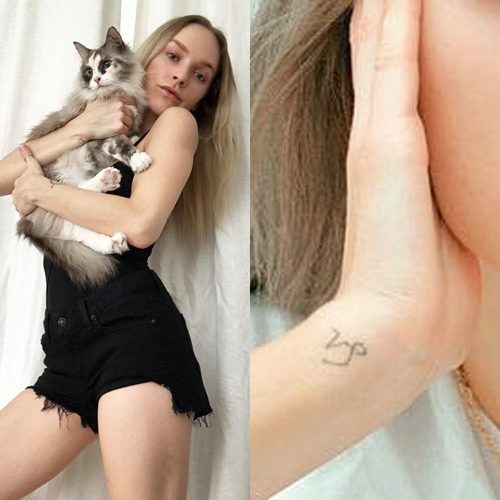 Lottie Moss has a Capricorn (her zodiac sign) tattoo on her left hip. 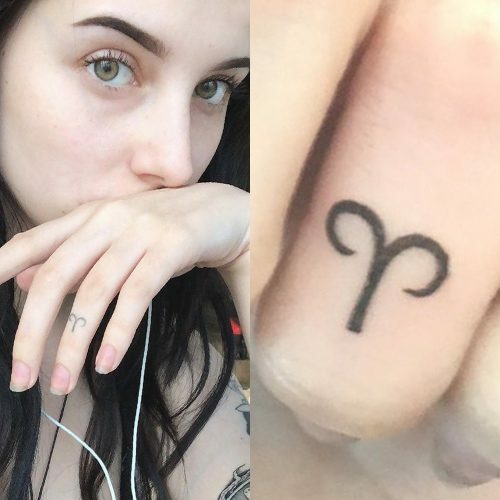 Taylor Alesia has her zodiac sign (Libra) tattooed on her left wrist. In a YouTube video she said that zodiac means everything to her and she really believes that zodiac signs describe the personality of a person. 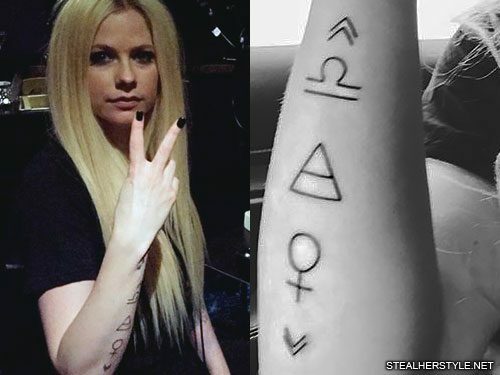 Taken together all three symbols represent Avril’s September 27th birthday — Libra is her star sign, air is the element associated with Libra, and Venus is the ruling planet for Libra. 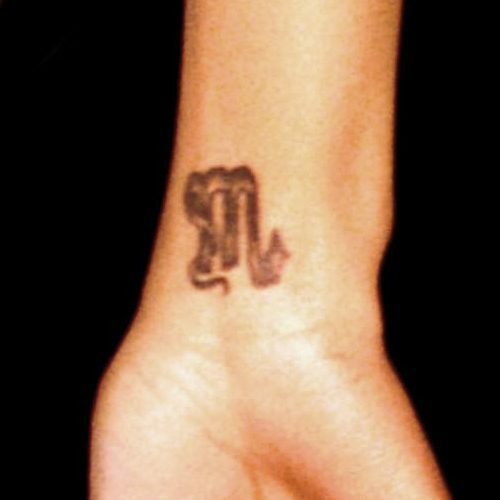 The Venus symbol is of course also used as a symbol for women, but that does not seem to be why Avril chose it. The double chevrons « » are known as guillemets and are used as quotation marks in some languages. These symbols have also caught on in tattoo culture with the supposed meaning “create your own reality.” It is claimed to be a viking symbol, however there is no documentation of this usage. 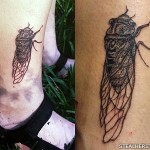 We believe that Avril is simply using them as quotes around the other symbols. 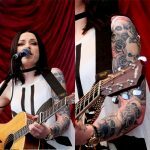 Zolita has the zodiac sign of her brother and sister inked on her right wrist – a capricorn. 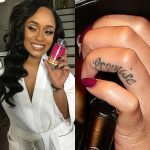 Monica Brown has a tattoo on the right wrist of her zodia sign – Scorpio.